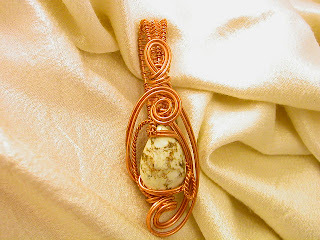 I really don't know what the stone is in this pendant. It's a creamy white color with fine brownish coppery lines and smudges.. the polish is not great so it has a soft sheen rather then a high gloss. I have observed a pair of beautiful drop earrings with a very similar stone, the maker said that her stones were a rare white turquoise that is highly valued by Native Americans. All I know is that I have never seen anything close to this before, if anyone has any ideas I would love to hear from you...?